Regular Grubsheet readers will be aware of the occasional blows we trade with Jon Fraenkel – an academic who specialises in Melanesian affairs at the Australian National University. Well, here’s a chance to hear us go head to head on the ABC Radio National program, National Interest. It’s a spirited debate on whether it’s in Australia’s national interest to maintain its policy of shunning the Bainimarama regime in Fiji to try to force it to hold an early election. Jon Fraenkel is part of a strong anti-regime cabal at the ANU, which includes the Indo-Fijian historian, Brij Lal, and Frank Bainimarama’s former land forces commander, Colonel Jone Baledrokadroka. All three are active political players, despite – in the case of Fraenkel and Lal – allowing themselves to be portrayed as independent commentators in the regional media. 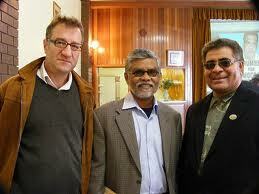 Dr Fraenkel is still to come up with any explanation of the circumstances of the adjacent photograph that Grubsheet published several weeks ago, showing him and Brij Lal at a Canberra gathering with Simione Kaitani, one of the principal figures of the 2000 George Speight coup. As listeners to the ABC program will hear, Fraenkel has no compunction in trying to smear Grubsheet as a “Bainimarama supporter” or a “supporter of the 2006 coup” when we’ve made it clear all along that our support is not for the dictator himself but his program for a multiracial Fiji as opposed to the racism of the government he removed. Yet here is Fraenkel in the company of a man – in Kaitani – who was a senior minister in that government, was at George Speight’s side throughout the events of 2000, has admitted publicly to committing sedition and insists that Fiji must always be led by indigenous Fijians. We’ll leave listeners to make up their own minds as to who has the stronger argument. I don’t understand why Jon Fraenkel is arguing here for a policy he admits isn’t working! If The Aussies and Kiwis can’t get Frank to change, surely they have to change their own approach. It’s all very well to stand up for a principle but it doesn’t make much sense if you’re sacrificing a more important principle and that’s your own security. Letting the Chinese get a stronger foothold in Fiji is mad. They may be keeping everyone afloat economically but they have their own agenda and aren’t in the Pacific because they like the beaches. It’s all about becoming a global superpower. Wake up Australia and NZ before it’s too late!! John I completely agree it is pure madness that Australia and New Zealand still refuse to engage with Fiji. It seems as if they have a blind spot when it comes to dealing with Fiji or not dealing with them as is the case here. It was also funny that the first words that Dr Jon came out with were that he doesn’t like the phrase tough love which is exactly what the big boys of the South Pacific have been dishing out over the last five years to no discernable effect. Also the irony of using Africa as an example of tough love working over the long term the less said about that the better. As Graham says there is no excuse for a coup and certainly no person in their right mind would support one but the reality is that one has taken place and instead of parrotting on and on about what Fiji should be doing perhaps Australia and NZ should re-engage and start helping Fiji realise its goal of a free and fair election in 2014. How can Jon Fraenkel be so irresponsible to acknowledge that China is moving into every area of the Pacific ( “it’s the 21st century so get used to it”!) while arguing that Australia and New Zealand should not resume ties with Fiji? I’ve never heard of anything so ridiculous. Anyone who’s been in Fiji recently can see the evidence of the increased Chinese presence. So Jon, it’s OK for a communist dictatorship to move into our backyard but it’s not OK to do business with another dictator trying to sort Fiji out and return it to democracy? Get real. What kind of agenda are you running here? The ABC interview just made me so angry at Australia’s stupidity. Jon is a typical hypocrite who comments from a safe haven and has the luxury to campaign for more isolation for us unfortunates in Fiji regardless of the facts before him. May I ask Jon how this will help us Fijiians and if as he suggests, this increased isolation will bring the current regime to it’s knees and no doubt it’s economy, can he guarantee that there will never be another coup in Fiji….so that this path is worth all our while. Fraenkel is a Qarase supporter, and getting him back to power is his personal crusade. Fraenke did not launch such a spirited campaign against George Speight, or the 2000 coup. This so-called ‘neutral’ academic is showing his true colours. Graham Davis makes a lot of sense. Fiji did not want, or need, a coup. But it happened, thanks partly to Qarase and his racist SDL, whose other proposed legislations included dual citizenship, and free form seven education, exclusively for indigenous Fijians. Yes, Bainimarama’s coup has been a disaster. And so was Qarase’s SDL, for that matter. The sensible thing is to get over the coup and move forward in the least chaotic and damaging manner. If this means engaging with Bainimarama, so be it. Fraenkel is in disagreement because his agenda is to get Qarase back in power (he never launched a campaign on Mahen Chaudhy’s behalf when he was kicked out by Speight). For Fraenkel, the return of SDL overrides everything else. Fraenkel insists Australia and NZ should isolate Fiji. But this policy has failed. What should Aust-NZ do next? If not engage with Fiji, than launch a military assault? That’s about the only option left. After all, Fraenkel’s buddies, Kaitani and Baleidrokadroka, have called for a revolution. As usual, the call is made from the safety of their overseas sanctuary. They give no thought to the safety and welfare of ordinary Fijians. Their overriding concern is revenge against Bainimarama, and his removal; by force if necessary. This will serve their narrow political interests, not the broader interest of Fiji, or its people. Baleidrokadroka and Kaitani have rejected suggestions to come to Fiji and lead the uprising. They expect others to do their dirty deeds. They will just swoop in and claim the rewards, as was the case with Kaitani in the 2000 coup (how did coup conspirator Kaitani get Australian residency? Shouldn’t there be an investigation? Someone alert the Australian media!). Does ‘Fiji expert’ Fraenkel understand the consequences of an uprising? Perhaps his head is too far up the clouds, and he needs to come down from his ivory tower. But I am more inclined to think that an academic of his background understands perfectly well the potentially bloody consequences of an uprising or military intervention. But for Fraenkel and his cohorts, the most important objective is the return of the SDL to power, by hook or crook. So what if some blood is split (it won’t be theirs). So what if the economy is destroyed, and race relations damaged even further, perhaps beyond repair, for generations to come? Academics like Fraenkel are playing a dangerous, high stakes game in trying to manipulate and use Australia and NZ to carry out their political agenda. The presence of Kaitani (and others like him) in the Fraenkel camp, should set alarm bells ringing. Aust-NZ governments should be wary of advice from ‘neutral academic experts’ driven by vindictiveness and revenge (what on earth is Brij Lal doing with this mob? Shame on him. He seems out-of-touch and politically naïve about Fiji- the effect of living in Canberra for too long). Australia and NZ should seek a cross-section of views. Davis is very knowledgeable about the ground situation in Fiji. His views are rational and make a lot of sense. He has the country and its people at heart. Fiji’s people owe him a debt for providing a more balanced picture of the situation in the country. To be fair to Lal, he would probably rather be in Fiji, but was forcibly expelled in 2009. Come on mate! Brij Lal must take responsibility for his decision to put down Fiji at every opportunity. He must take responsibility for allowing himself to be photographed with one of Geroge Speight’s henchmen…Simione Kaitani. The saying goes that if you lie down with dogs you will pick up fleas! The facts are that Brij Lal gave up his Fiji citizenship to become an Australian citizen! Like others of his immediate ‘reference group’ – Fraenkel, Baleidrokadroka, Rokoului Mara, Simi Kaitani, Sam Speight, Daunitutu etc… they all live overseas and are no longer Fiji citizens! So what is the issue with Fiji ‘forcibly removing’ non-citizens who enage in politics in Fiji? Australia does the same. So does NZ and other countries! Fiji is a sovereign country and in the words of former Aussie PM, John Howard ..”we will decide who will come into this country and when”. Why cant Fiji apply the same rules as Australia? Lal left Fiji of his own accord. Yes he was harrassed etc. But he did decide to talk to the Australian media while he was in Fiji. He didn’t have to do that. I’m sure he knew he was on the regimes radar, so why did he talk? A: because he loves the sound of his own voice. I’m sure Lal has a martyr complex. Bainimarama gave himself a massive back-pay courtesy of the Fijian people, let his brother in-law out of prison for murder and re-instated him as head of the navy, authorised bashings of civil society representatives and trade unions, arbitrarily arrested suspected opponents (including business people, lawyers, church leaders etc), closed newspapers and suspended the constitution. Not to mention the fact that at the time of the 2006 coup the military was being investigated by the chief of police for allegations of torture (following the mutiny in late 2000). How can one possibly support Bainimarama’s programme for a multiracial Fiji, if these are the means by which it is obtained!!! Sure SDL figures may have some linkages with Speight’s coup, and some are ultra-conservative racists. But that doesn’t justify the regime’s clamp down in Fiji. Opposing the regime doesn’t make you part of a ‘cabal’. Surely Fiji’s fledgling democracy needs debate, not fear. If you don’t like Qarase, make sure he doesn’t get elected by running for parliament, or by organising peacefully. Where is the evidence that Bainimarama is moving toward a multi-racial Fiji? Have the plans for non-racial elections been finalised? Has a charter outlawing discrimination been drawn up? Is there a real timeline for elections? Engagement is a two-way street. Shut this blog site down because it is irrelevant and out of touch with the reality on the ground in Fiji. Why should the democratic and human rights of everyone in Fiji be used as ransom by a dictator who wants the world to accept him and his illegal regime? Coups and dictators are nothing new to Fiji and they only bring negative outcomes for the country and its peoples. Any one here who supports the rubbish going on in Fiji at the moment needs a head check at St Giles because an illegal regime that forces people to do things against their will is an evil regime. The solution to Fiji is so simple, a) Voreqe returns to barracks,resigns or disappears altogether. Citizens reclaim their rights, hold an election and move on with life without the shackles of an irrational dictator. Why can’t this simple exercise be done? The answer lies in too much Bainimarama corruption and greed for power. “The solution to Fiji is so simple.” Only in Smith’s simplistic mind. It’s so simple that it dragged on since 2006. Smith doesn’t sound like someone who has lived in Fiji. His grasp of the issues is rather naive, and his quick-fix suggestion is laughable. Yes, it will be so simple to dislodge Bainimarama from power (that’s why he is still PM). Instead motherhood statements and regurgitating facts that have been obvious to all and sundry for several years now, does Smith have any new or practical ideas? Rather than shut down this blog,Smith should give us all a break from his cowboy mentality. Brij Lal was not forcibly expelled from Fiji. On the contrary. Mr. Lal had emigrated to greener pastures well before the coup. Financially, Australia was more enticing. Money talks. It’s as simple as that. Fijian academic institutions do not offer the same rewards, particularly to those historians who have built their entire academic career writing on coups in Fiji. If I were Fraenkel, Lal, Kaitani and other self serving champions of “democracy” I would offer a toast to Bainimarama and all the other coup leaders of the past because without them I would not have received the public exposure, the chance to star, the media attention, the possible financial gain and a subject for my next academic ramblings. All these folks are motivated by self interest. That is the one fact that binds them together.Brij Lal wants the 1997 Constitution restored because he was a member of the comittee which drew it up and he does not want his name to become yesterdays trash. That Constitution defined Mr. Lal’s view of “democracy”. It was a Constitution which was based on unequal rights. and while it was not racist, it clearly separated the voters along racial lines and thereby had the effect of making people think racially. It was a Constitution which allowed for discrimination to prosper. Not very democratic. Mr. Fraenkel is a soft headed professor of sorts. His agenda is to return Fiji to the glory days of the SDL. Without the SDL he is a nobody. Mr. Kaitani is an avowed racist. He has made this clear in his own words. It serves him well at this time to hunt with the Indian and the European but they better watch their backsides once he’s in power. These folks should be confined to the garbage bin for all their sanctimonious crap about “democracy”. Go take a shower. Well said Jack. Though I wouldn’t give Fraenkel the honoured title of ‘Professor’ as soft as his head may be. Lal is only interested in writing himself into the History of Fiji. He is not a scholar of politics. I suspect his one sided view of History based on his personal experiences and obvious political agenda will be judged in time for what it is. It’s kind of sad and pathetic when you take time to think about it.